The first GREEN aspect of the trip was that all 6 of us squeezed into one car, luggage and all, to carpool to the airport. We nicknamed it the GREEN MACHINE. 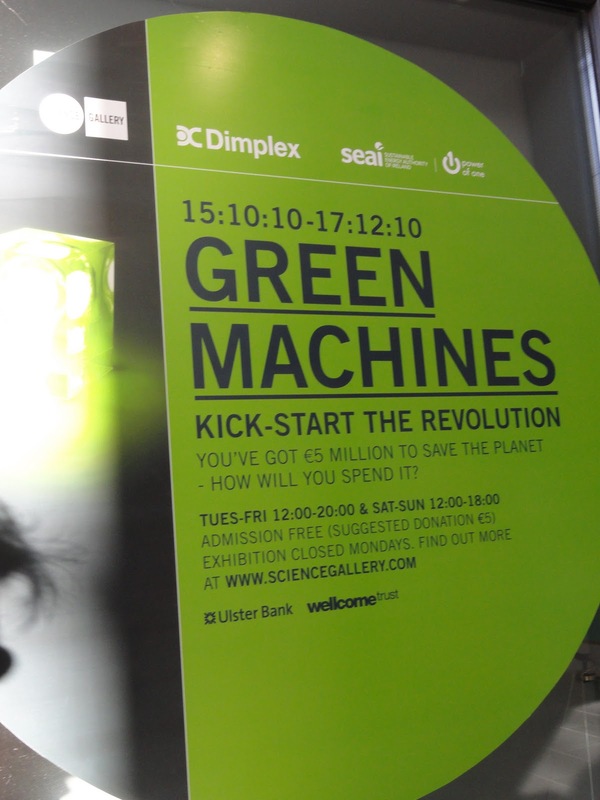 There were some pretty cool and different (for me) environmentally-friendly things in Dublin that caught my eye. 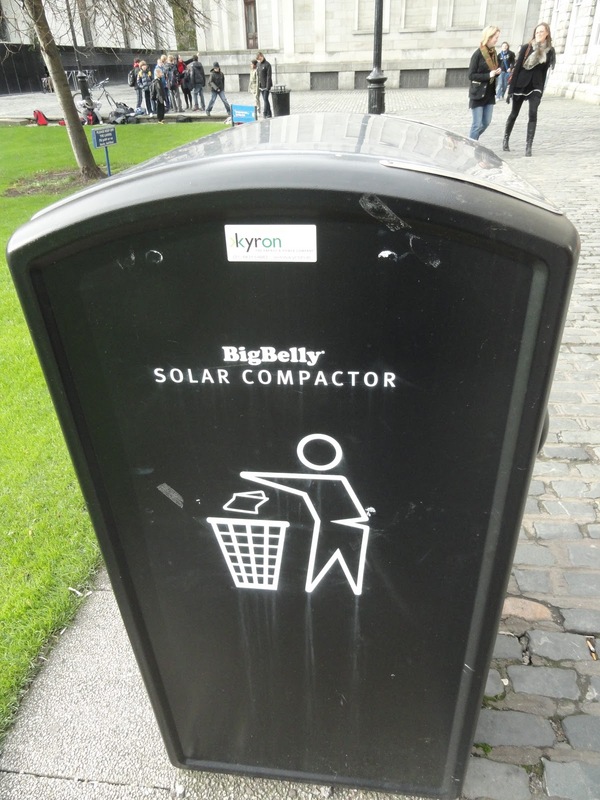 Like these cool solar compactor trash cans. This one sits outside the entrance to the Book of Kells Exhibit at Trinity College. Another day while walking near the campus we came upon this display in a window which we all thought was fabulous. It's a flower grenade! Ha ha! It was part of this really cool cafe/shop/science exhibit which was closed while we were walking by and unfortunately we didn't manage to make it back for the time when it would be open. We also saw lots of opportunities to buy and eat locally grown vegetables and meats, even stumbling upon a local outdoor market that spread out over 3 streets with 3 different themes: local handcrafts, local foods (including locally made baked goods, cheeses, meats) and locally grown produce. We tried some of the local goodies and 2 friends picked up some knit goods. The best part of our trip though was the day we spent in the country, which is just as GREEN as you would imagine, even in November. Have you heard of Habitat for Humanity ReStores? We're getting one in Cromwell - to be opening soon, as in this month. You can donate materials from your building/remodeling projects...for instance a friend is remodeling a perfectly good bathroom just because she doesn't love the color...she could donate her cabinets or fixtures. How it works is you call or send an email to jdoyle@habitatmiddlesex.org or call 860.343.9179 and they set a date to pick up your items if they can use them. Those items are sold in the store, and reused (very GREEN!) and proceeds are used to build more affordable homes in Middlesex County! 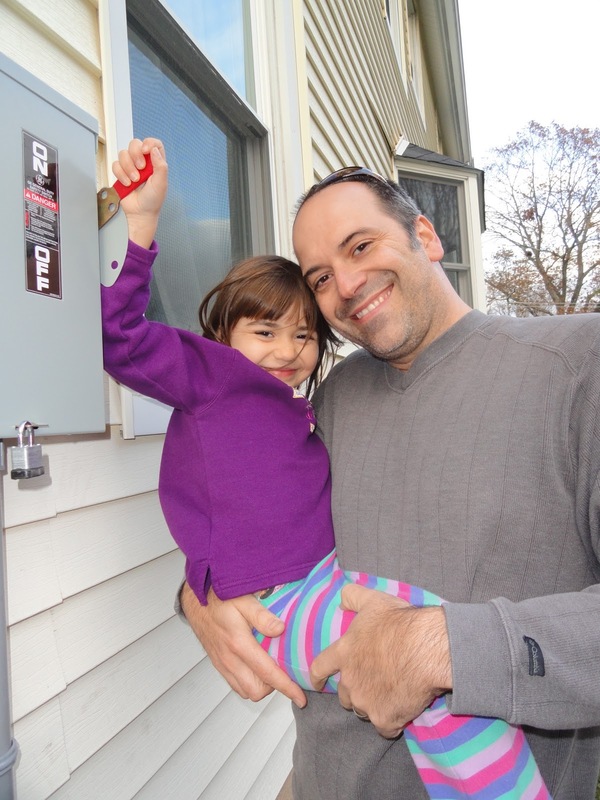 For more information, go to http://www.habitatmiddlesex.org. I've always wanted to visit those stores and I'm excited that we'll have one nearby. 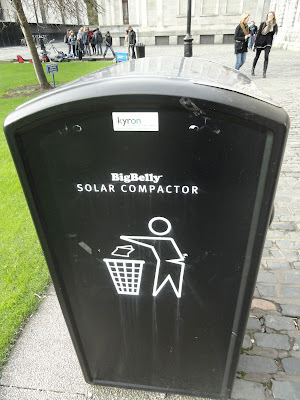 What would a post be without a quick update on my solar life? The same day I posted last week, CL&P showed up with the new meter, installed it in a flash, then the activation order came in a few hours later. We fired up the system to great fanfare (and someone celebrated with a vodka tonic) and it has been live for almost a week now. Waiting for the GREEN light...could that have 3 meanings? The first might be waiting for the go-ahead to power up the solar electric system from my local utility company (CL&P) once they've installed their new electric meter outside my house. 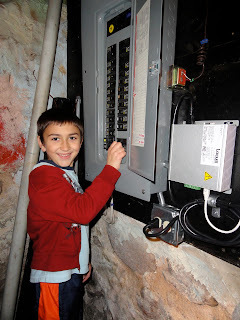 The 2nd would be the actual GREEN light on the inverter that indicates we're generating power. The 3rd is a little more obscure, kind of like waiting for the light to dawn on me, only in the environmental sense? My GREEN awakening? Yeah, I guess that's already happened. Tuesday morning was the inspection with the town and electrician from Sunlight Solar, Paul, who also installed a line into our router box for the Locus box. 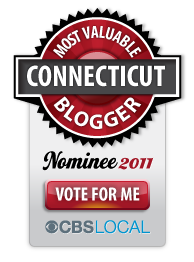 The Locus box will read how much power we produce and transmit it to a website that both we and the Connecticut Clean Energy Fund will monitor. The inverter itself has a digital display that will read how many lbs of CO2 we've saved and how much energy we're producing, etc. You just know I'm going to be sitting down there staring at it the first week to see where the numbers go! (Kind of like how we watched our first load of laundry in the new front-loader 10 years ago!) The new meter in the basement will show a continuous run of how much energy we've generated. Speaking with the town inspector, he told me that over the summer he'd seen 6-8 solar applications here in town. I'm going to have to drive around and check on those! 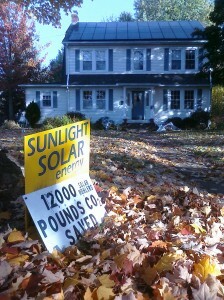 I was on Sunlight Solar's website reading how these clients in West Hartford just celebrated their 1 year solar-versary and put up a sign in their front yard announcing they've saved 12,000 lbs of CO2! Now we wait for CL&P. We were told it may take up to 2 weeks to go live. In the meantime, I've been reading my Photon Magazine! I also borrowed The Lazy Environmentalist from the library, but Photon Magazine turns out to be better reading.